The Planners4Health task force in Washington State contributed to the completion of the Phase I Assessment of the need for a comprehensive and collaborative review of the state’s growth planning framework. Advancing a cross-sector approach and a Health in All Policies framework, the Phase I report was completed on August 1, 2017, and is summarized in this blog post. The full report document may be downloaded here. In Washington State, there are a number of laws in place to manage growth and land use. The Growth Management Act (GMA) is the overarching statute that governs how local governments manage growth in their respective jurisdictions. Although the GMA occupies a central place within the State’s planning framework, it is just one of many laws that affect the state’s economic, environmental and human health. Other planning statues such as the Planning Enabling Act, Shoreline Management Act (SMA) and the State Environmental Policy Act (SEPA) support many of the goals listed in the GMA. These planning statutes affect a wide range of interests and have been contentious with multiple parties. GMA has been in place for over 25 years, SMA, SEPA and other laws for even longer. No formal government-sponsored assessment has been done to see how well these 20th century laws align or how the overall planning framework enables Washington to meet the emerging challenges of growth and change in this century. In response to queries from the Washington State Legislature and others, the William D. Ruckelshaus Center recommended conducting an assessment that would examine Washington’s framework for managing growth including a process to articulate a statewide vision and collaboratively map a path to that future. The process for creating a collaborative roadmap would involve participants across the state to: (1) articulate a vision of Washington’s desired future; (2) identify opportunities and current successes of state laws, institutions, and policies; and (3) build agreement for needed course corrections and future implementation. To gauge support for this effort, the center conducted a Pre-Assessment from October 2016 through June 2017. The Pre-Assessment consisted of a series of conversations with individuals from the following groups, organizations, and governments involved in various growth management efforts. Seven entities became sponsors of the pre-assessment and provided a total of $100,000 to support it. Is now the right time for an assessment that would examine Washington’s growth management framework, including a process to identify a desired statewide vision for Washington’s future? Is the Ruckelshaus Center an appropriate neutral convener to facilitate such an assessment? Would you be interested in participating in such an effort? 1. Is now the right time for an assessment that would examine Washington’s growth management framework, including a process to identify a desired statewide vision for Washington’s future? There was broad support for conducting an assessment of Washington’s growth management framework and a process to identify a desired statewide vision for Washington’s future. Several parties pointed out that while the GMA has been the focus of calls for revisions, such efforts have typically been prompted by anecdotal experiences rather than comprehensive or empirical evidence. Many observed that, in addition to the GMA, there are other state laws that affect land use, transportation, economic development, resource conservation, environmental protection, service delivery, and governance. There was also strong support for an assessment that included the entire planning framework. During the pre-assessment, a number of parties brought up issues that were of interest or concern to them, to illustrate why a process examining Washington’s growth management framework was both timely and important. Many expressed a sense of urgency due to decreasing housing affordability, increasing transportation congestion, continued loss of productive farmland and viable marine habitat, uneven distribution of economic prosperity and human health across the state, and a lack of fiscal tools to keep pace with infrastructure and service delivery demands. 2. Is the Ruckelshaus Center an appropriate neutral convener to facilitate an assessment? Virtually all of the parties were familiar with the mission and the history of the center as a neutral facilitator in collaborative efforts to address public policy challenges. Many had direct experiences with prior Center-facilitated processes such as the Voluntary Stewardship Program, Chehalis Basin Strategy, Joint SR 530 Landslide Commission, Columbia River Salmon and Steelhead Assessment, Tri-Cities Governance, and Coastal Resilience. There was confidence that the Ruckelshaus Team had both the process and subject matter expertise to conduct this type of project. 3. Would you be interested in participating in such an effort? All of the parties expressed strong interest in participating in the project going forward. Center staff explained to all parties the general outline of the process contemplated and the amount of time or other resources that they would be asked to commit. None indicated a lack of desire to participate. Based on the findings of Phase I, the Washington State Legislature allocated to the center $600,000 in the 2017–2019 biennium operating budget to support the project and provided direction regarding the purpose, process, parties, and deliverables. The center will explore opportunities for supplementary funding to support additional elements of the project such as expanded applied research. The scope of the project is the State of Washington’s planning framework of laws, policies, and institutions. While the primary focus will be the Growth Management Act, (RCW 36.70A) the planning framework also consists of other statutes, some of which are named below. At this time, the center’s project team has identified the following components of the project. Interviews: The center’s project team will conduct one-on-one interviews with individuals, groups, organizations, and governments. 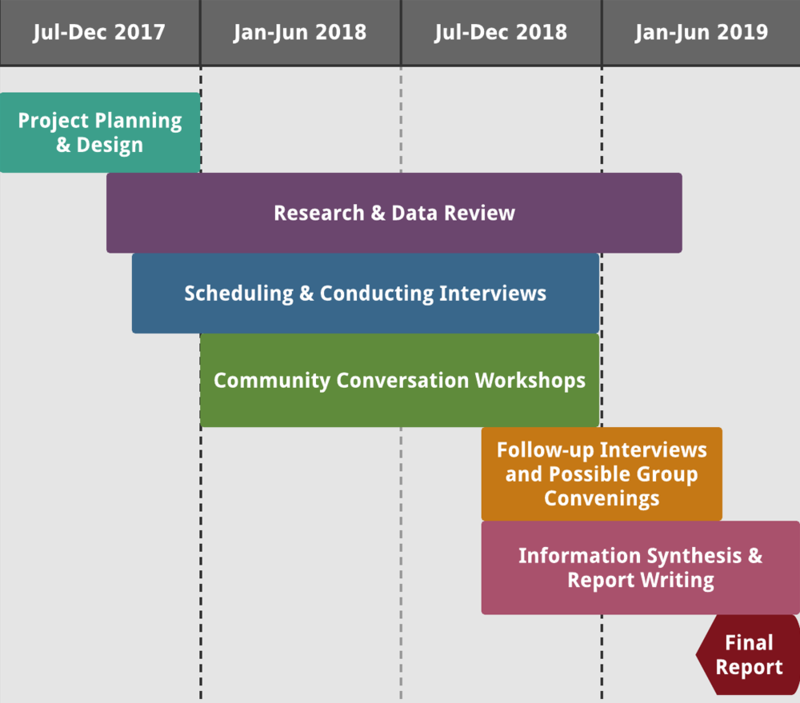 Community Conversation Workshops: The center’s project team will host workshops across the state to engage participants in identifying a desired vision for Washington’s future. Other Mechanisms for Input: The center’s project team will explore and design additional opportunities for individuals to provide information and input. Research and Data Review: The center’s project team will identify pertinent data and partner with state public universities on targeted research. Communications Strategy: The center’s project team will be developing a strategy for communicating about the project. This may include a webpage that will be updated throughout the project and quarterly project status updates. Funding Strategy: Given the scope and complexity of the project, additional funding may be necessary to support some of the project components. The center’s project team will be identifying potential additional needs and developing a funding strategy. Washington State Growth Management Plan. Image courtesy William D. Ruckelshaus Center. The center will submit a final report to the appropriate committees of the legislature by June 30, 2019. Top image: Bikers in Pierce County, Washington. Photo courtesy Puyallup Watershed Initiative, Active Transportation Community of Interest. Joseph Tovar, FAICP, is founder and principal of TovarPlanning and project manager of the William D. Ruckelshaus Center in Seattle.